If you are up to date with the current trends in the world of economy, you will undoubtedly have heard of the phenomenon called Bitcoin. This is the first real cryptocurrency that was created almost a decade ago, but has only caught public attention in the last year or so. Like all other cryptocurrencies, Bitcoin does not exist physically. Rather, it is an exclusively digital currency, but a real one nonetheless. Its popularity exploded with numerous stories of overnight financial success, and it is becoming increasingly more common for various services to accept Bitcoin payments today. – It is secure and anonymous. All transactions are recorded only in the “blockchain” and there is no way to discover a person’s identity simply based on their Bitcoin wallet. – There are no transaction fees. All transactions occur peer-to-peer, so there are no processing fees or anything of that sort. These are normally unavoidable if you’re doing business through banks, PayPal or similar services. Ultimately, these fees can take a big bite out of large transactions, as well as damage your profits in the long run. – It is independent and non-taxable. Seeing as Bitcoin is not any particular country’s currency, it cannot be controlled and manipulated by either your home country or any third parties. Moreover, you cannot be held legally obligated to pay taxes on your Bitcoin wealth. With all that said, it is quite obvious as to why Bitcoin is becoming more and more popular a payment solution for many businesses out there. Hosting providers, naturally, count among those. Bitcoin makes it very convenient to conduct business internationally all over the globe, without having to suffer the countless fees that would inevitably follow with conventional payment methods. 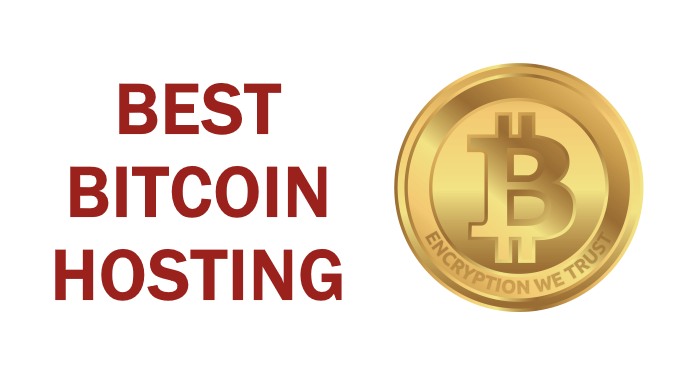 What we will do here today is list the 10 best bitcoin hosting providers out there, focusing mostly on bitcoin web hosting. Keep in mind that all of the hosts mentioned accept Bitcoin, but list their prices in regular currencies such as USD or EUR for easier reference. Bitcoin value is known to fluctuate wildly from time to time, and this model helps maintain consistency. So, without further ado, let us dive right into it, shall we? HosterBox was founded in 2005, in the Canadian capital city of Ottawa. Today, all of their servers are located in Canada and connected via a Gigabit network, ensuring maximum speed and efficiency. They offer several types of hosting services, Bitcoin hosting included. Hosterbox offers web hosting, VPS, dedicated and reseller hosting services. Web hosting specifically comes in four distinct plans, ranging from $3.95 to $9.95 per month. Each of these plans includes an unlimited number of subdomains, but that is the only thing they have in common. When it comes to bandwidth and storage space, their fourth and most expensive “Business” plan places no limit on either of those. For the first three, however, storage scales from 10GB to 50GB, which is quite average but sufficient for some people’s needs. As for the bandwidth, it is quite high even at the low end, going from 100GB to 500GB. There is a long list of additional benefits and features that come with each plan, and all of them can be paid for with Bitcoin. Hosterbox is, all in all, an affordable and reliable service. Fast connections and affordable but powerful packages, in addition to responsive 24/7 customer support, are only some of the benefits of choosing them as your bitcoin hosting provider. NameCheap is a Los Angeles-based hosting provider, and they have been around since 2000. Today, they offer a range of services that include web hosting, VPS, dedicated and reseller hosting. More importantly, they also offer bitcoin hosting, as they have recently introduced it as a payment method. Namecheap’s web hosting plans are divided into four separate offers, with three “main” plans and a special “Business SSD” plan. All of these can utilize servers in either the US or the UK, based on the client’s preference. The specifications and features remain the same, while the only noticeable difference is the price, which is about twice as high for all but the fourth plan. The three main plans all offer unlimited bandwidth and 20GB/50GB/Unlimited SSD-accelerated storage space respectively. The business plan is a bit different – it is limited to 5TB of traffic and has 20GB of pure SSD storage. Moreover, it should also be noted that the first three plans can only be used with a 1-year contract and are thus paid for annually, while the fourth supports either 1-year or 6-month contracts, in addition to monthly payments with no contractual obligation. The prices range from $9.88/yr to $29.88/yr for US servers, and $21.88/yr to $41.88/yr for UK ones. As for the business plan, the price starts at $19.88 and $20.88 in the US and UK respectively. The servers are located in highly developed countries, which can be both a good and a bad thing. If you want minimal latency and the quality that comes with US and UK-based servers, go for Namecheap. However, if your focus is more on reaching an international audience without spending too much, there are other companies out there that can better cater to your bitcoin hosting needs. Shinjiru is a prestigious and widely known offshore hosting company. The company was founded in 2000, and has since been headquartered in Kuala Lumpur. However, they operate a total of eight different datacenters around the globe. This allows for some of the highest versatility among offshore bitcoin hosting providers, as well as all hosting providers in general. Shinjiru offers VPS, dedicated servers and web hosting plans that can all be paid for with Bitcoin. When it comes specifically to web hosting, all of their 8 datacenters are available: Malaysia, Bulgaria, the Netherlands, Hong Kong, Lithuania, Luxembourg, Russia and Singapore. All three offer unmetered bandwidth, a convenient one-click installer for apps and 24/7 support. The differences lie in storage space and the number of websites that you can host. For the most expensive option, both are unlimited. However, the other two are limited to 100GB and 200GB, as well as 1 and 2 sites respectively. It is also worth noting that none of these plans offer DDoS protection. Shinjiru is unprecedented when it comes to geographical versatility, but the same can’t be said for their web hosting plans. If you are looking to get the most out of a web hosting plan itself, you won’t be amazed at what they offer. Furthermore, a complete lack of DDoS protection for any of their plans definitely raises some red flags for the more security-oriented customers. Nonetheless, their many locations and many years of professional background definitely make them a good choice for your bitcoin hosting needs. SuperBitHost is an international hosting provider which has servers located in a total of 24 countries around the world. While their shared hosting and VPS hosting offers are available in a total of 8 countries across Europe and Asia, their dedicated servers are present on each continent. The company accepts payments for their services in the form of Bitcoin and LiteCoin, in addition to PerfectMoney. When opting for any of SuperBitHost’s web hosting plans, you will first need to pick a location. As said, these include eight countries. Hong Kong, Malaysia and Singapore are available in Asia, while Bulgaria, Lithuania, Russia, Luxembourg and the Netherlands are available in Europe. There are a total of three plans, priced from $18 to $36 per month. All three offer unmetered bandwidth, but only the highest priced one includes features such as DDoS protection and a dedicated IP address. Moreover, the third plan includes unlimited storage space, while the former two planes are limited to 100GB and 250GB respectively. Something that is also worth noting is the fact that none but the servers located in Malaysia support Windows, with all the other servers running on Linux exclusively. What’s more, the company also has a limited offer when it comes to the Bulgarian and Hong Kong servers. Namely, they only offer the most expensive package in those countries. The features, however, remain the same. SuperBitHost definitely excels in terms of geographical flexibility. On the downside, the hardware specs and features that come with their web hosting plans are nothing to marvel at, especially considering the price. So, if you want to ensure minimum latency for your site’s viewers in a particular area, SuperBitHost is a very good choice. If you’re more focused on quality hardware and software versatility, you should probably look elsewhere. OrangeWebsite is an Iceland-based hosting provider that was founded back in 2006. They can easily be distinguished by their focus on Bitcoin, both as a form of payment for their services and as a frequent subject of articles posted on their site. Their services include web hosting, VPS and dedicated hosting solutions. OrangeWebsite offers a total of four web hosting plans. These are all rich with features, including a free website builder, a 1-click installer, cPanel access and advanced DDoS protection. The plans differ mainly in terms of storage space and bandwidth. To be more specific, the storage offered ranges from 1GB to 20GB, while the bandwidth ranges from 100GB to 2TB of traffic per month. Moreover, additional add-on domains are available with all but the cheapest plan, and each of them include a 30-day money-back guarantee. Lastly, their prices range from 3.40 EUR to 24.90 EUR per month. OrangeWebsite is fairly straightforward about their philosophy. Their company supports free speech and green energy, which reflects on their services. Needless to say, their packages offer plenty of useful features and are priced fairly, but the somewhat limited space and traffic might be discouraging for business owners or anyone with higher performance requirements. If you don’t count among those, however, OrangeWebsite is a good choice when it comes to bitcoin hosting solutions. CCIHosting is a Panaman hosting provider, headquartered in the country’s capital that bears the same name. They are a very popular offshore host, and have been operating ever since 2002. Apart from high speed connections and their responsive 24/7 customer support, they are also known for accepting several cryptocurrencies as payment. This includes not only Bitcoin, but also three other cryptocurrencies: Ethereum, Dash and LiteCoin. CCIHosting offers a range of services: web hosting, VPS, dedicated hosting, as well as VPN and colocation services. When it comes to web hosting in particular, it is divided into four distinct plans, with a price range of $10.95 to $40 per month, excluding the first month discount. All four plans come with DDoS protection, and all but the cheapest one include unmetered bandwidth and unlimited disk space. As for the CPU frequency and RAM capacity, they range from 512MHz to 2GHz and from 0.5GB to 2GB respectively. While the hardware involved may not be overly impressive, the server location and software features more than make up for it. If you are not too demanding when it comes to raw power and just need an accessible website, CCIHosting would be a perfect solution when it comes to bitcoin hosting services. QHoster is a versatile hosting provider founded in 2004. Currently, their servers are situated in 13 locations around the world. These include four locations in the USA, one in Mexico and one in Canada. Furthermore, they have servers located in several parts of Europe, as well as one in Asia, specifically Singapore. QHoster is incredibly versatile in terms of payment methods, both international and localized for the countries in which they conduct business. They accept three cryptocurrencies: Bitcoin, Litecoin and Dash. QHoster’s web hosting offers are divided into three distinct plans. What each of them have in common are: unlimited bandwidth, cPanel access, 1-minute setup, a free domain name and DDoS protection. Naturally, however, there are some noticeable differences two. The most advanced plan includes a free private SSL certificate and a dedicated IP address. Conversely, the two cheaper plans include free shared SSL certificates instead. And lastly, each plan comes with a storage space of 10GB, 150GB and 250GB respectively, while the prices range from $2.54 per 3 months to $12.94 per month. QHoster’s web hosting plans are truly exceptional. The distinguishing trait seems to be versatility and convenience, but raw power isn’t lacking either. Their top-priced plan is particularly impressive, especially given the relatively low price tag. That said, if you want reliable bitcoin hosting and you want good value for your money. QHoster is the way to go. With a name such as that and the recognizable Guy Fawkes mask as part of their logo, it is quite obvious what Anonymously’s game is. Next to nothing is known about the company, apart from the fact that their servers are located in the Netherlands. They specialize exclusively in bitcoin hosting, meaning that bitcoin is their only accepted form of payment. They only require email activation in order to begin providing their service. Anonymously offers web hosting, VPS and dedicated hosting solutions. As for web hosting in particular, it is divided into four plans, with prices ranging from $4.95 to $29.95 per month. All of these plans ensure complete anonymity, include cPanel access and a 1-click application installer. Everything else is scaled with price: CPU power, RAM capacity(0.5-4GB), SSD storage space(10-100GB) and bandwidth(50GB-1TB). Additionally, any of the plans are eligible for a dedicated IP add-on which costs $3 in all four cases. At first glance, Anonymously may seem a tad shady due to a lack of company info, but they are a completely legitimate business and have been providing a reliable service for over a year now. Moreover, their server specs are quite good, and if privacy is your main reason for seeking out Bitcoin hosting, then Anonymously might just be the ideal choice for you. This Dutch hosting company is currently our top ranked offshore hosting company, so it is no wonder that they have landed themselves a high spot on this list as well. Since 2012, AbeloHost was operating out of the Netherlands and has provided numerous customers with rock-solid and reliable service. Bitcoin hosting is a part of the numerous services that they offer, although they do not accept any other cryptocurrencies for that service. AbeloHost offers several web hosting, VPS and dedicated hosting solutions. There are four web hosting ones, all of which come with SSD storage. The capacity of the aforementioned SSD’s scales with the price, along with all the other elements. These include, processing power, RAM capacity, and bandwidth. While their cheapest 5.99EUR plan is an obvious budget solution and is not much to look at, the most advanced one is surely impressive. For 28.99EUR, you get to use 2 CPU cores, 4GB of RAM, 80GB of SSD space and a terabyte of bandwidth. These are incredibly powerful specs, and blow competition out of the water. If you are looking for secure, reliable and powerful bitcoin web hosting solution, AbeloHost is the place to go. The value-for-money that you get here simply cannot be beat, especially when you consider that every single one of their web hosting plans comes with SSD storage. LyteHost is one of the youngest companies on this list, having only started operating in September last year. However, their quick rise and the multitude of services that they offered straight out of the gate both speak volumes. They are based in Ukraine, they specialize in bitcoin hosting and, thus, only accept Bitcoin as payment for their services. LyteHost offers a range of services that include web hosting, VPS and dedicated servers. The web hosting plans come in three variants, the cheapest being priced at 99$ per month and the most expensive one at $199. All the web hosting plans come with unlimited bandwidth and an unlimited number of domains, in addition to a dedicated IP address. What sets the priciest option apart are two key features: free domain name registration and data transfer. And lastly, the only option lacking with the cheapest plan is international support, but it is present in both of the other two plans. From time to time, a new kid appears on the block who just might be destined for greatness. LyteHost is most definitely one such case. They are versatile, reliable, and already have a number of wholly satisfied customers. So, if you opt to turn to LyteHost for your bitcoin hosting needs, you can hardly go wrong.